Transports you back to your childhood! Cool retro airplane with whirling propeller! 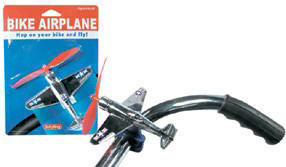 Size (inches): 5.00" X 0.51" X 7.01"
Fasten this plastic airplane onto your handle bars and take off. The planes propeller whirls as the wind goes racing by. Schylling is one of the country's leading manufacturers of specialty toys. Since 1975, they have been creating the future with their new, innovative designs and reviving the past with retro toys. Some of these toys were popular in the 1950's, some date back to the turn of the century. Other toys are completely new inventions.